France had the honour to assume the Presidency of the G-20 in 2011 with the summit held from 3-4 November last in Cannes. 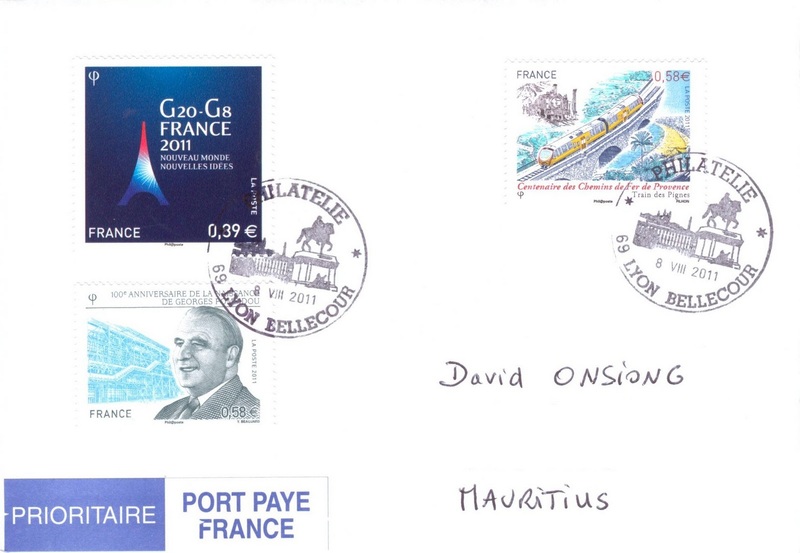 The town of Deauville on the other hand hosted the G-8 Summit earlier this year in May. 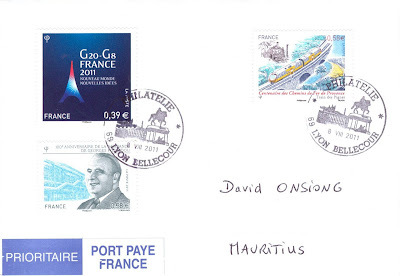 La Poste issued on July 11, 2011 a special 0,89€ stamp to mark these unique events. The motto "Nouveau monde, nouvelles idées" (New World, New Ideas) and the logo of this 6th meeting of the G-20/ 8 are present on the stamp. 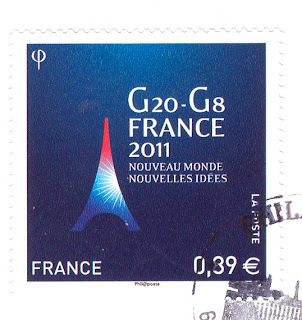 The G-20 represents 85% of the global economy and two third of the world population. Its principle is based on a system of annual rotating presidency. 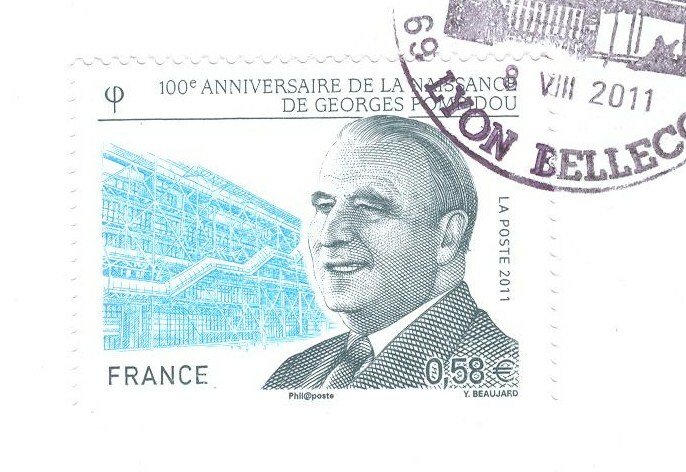 La Poste also issued a commemorative stamp on June 23, 2011 to celebrate the birth centenary of former President - from 1962 to 1968 - Georges Pompidou (1911-1974). 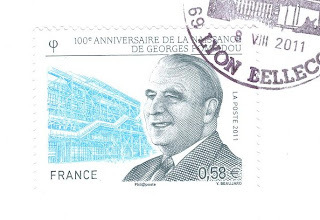 The stamp was designed by Yves Beaujard, also the designer of the Marianne stamps, from a photograph taken at the reception by President Pompidou of British Prime Minister Edward Heath, with in the background the Georges Pompidou Centre, designed by Renzo Piano and Richard Rogers. The Railways of Provence are made ​​up of three rail networks among which the Alps network with the line between Nice and Digne-les-Bains, completed in 1911, being among its lines. Today under the authority of the Provence-Alpes-Côte d'Azur region, it is the only railway line still in operation and carries more than 400,000 passengers per year. The line will soon have one new and more modern rail car. 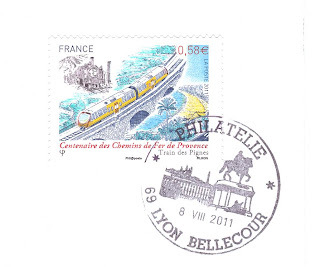 The 0,58€ stamp, designed by Claude Perchat and released on June 27, 2011 illustrates the 'Train des Pignes'.